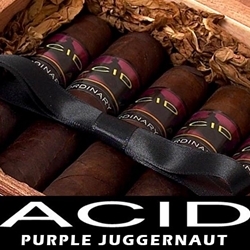 When you’re in need of a rich and flavorful smoke that's not too strong or robust, try one of these great styles of the Acid Purple Juggernauts. Each of these hand-rolled premium cigars are bound with a US Connecticut shade wrapper, infused with the right essential oils, herbs, and botanicals with the finest long filler Nicaraguan tobaccos. Every Acid Purple Juggernaut is expertly cured and stored in oak casks for 150 days to acquire a more complex flavor. Guaranteed to provide an enjoyable smoking experience that’s sure to last, Smokers Discounts offers Acid premium cigars in numerous varieties of sizes and flavors. Check out all the styles available here for a discount price! Call us for more details!